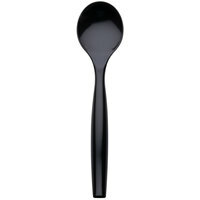 This Visions 10" black disposable plastic serving spoon is the perfect addition to your catering and party supplies! Providing a simple yet attractive design, this spoon combines appearance and functionality into one great product. Serve up everything from pasta and potato salads to vegetable sides, sauces, dressings, and more! Additionally, the long, smooth handle provides a comfortable and sturdy grip for your serving staff. LOVE LOVE LOVE this brand for our serving utensils! They are very sturdy and make the presentation look great for all of our catering orders. Durable plastic, can easily be used numerous times if hand washed. Great portion size for toppings or side dishes. Sleek black design and finish add elegance to any event or business. Comes in a 6/pack, great value! These are high quality spoons for catering at the right price. Very happy to have purchased these. The catering clients do like them very much! These spoons are a little on the pricey side, but they are very durable and feel high quality despite them being made of plastic. Would buy again for catering events. We were looking for something that was a little more durable than other serving fork/spoon combinations that we’ve used in the past when we came across these. These certainly withstood the rigors of buffet style self serving for over 1000 people. I was even able to use them when making slaws with heavy cabbage without having them break on me like others have in the past. Very easy to use and very economical. I use these for catering and its nice that its disposable and used only once so i don't have to worry about it at the end of catering. This is a quality product for our catering needs. They are good for drop off catering and disposable for catered parties. Great product for the price, happy with our purchase and will be purchasing again! These were very sturdy serving spoons. They worked well for our event. They didn't melt when using them for hot food and they were deep enough to serve sauces. This serving spoon is good for serving purposes. You could also use it for a light stir such as dry ingredients and sauces. I hand wash the spoon easily. There's not too much I can say about these spoons but they are good quality and we use them everyday for our drop-off caterings. I am pleased with them and will continue to use them for events. Great spoon for catering to leave in the food for serving. Good price and sturdy. We use these for all our parties that we cater. Looks nice too. Another great sturdy black serving spoon. I really like the way the black plastic makes my food pop with color. Perfect portion control as well. These spoons are high quality for being disposable. We use these for serving utensils on our catering buffets when the customer is using disposable products. There are 6 spoons in a pack which is the perfect amount for us to just grab a pack per event we are doing. Great disposable spoons for large bulk orders of food. They come in packs of 6, so very easy to just grab a pack and include it in food orders. Usually ends up being the right amount of spoons for our buffet set ups. These spoons are awesome! They are a great size for serving and durable quality. I am very impressed. I wouldn't be surprised if they even hold up well in the dishwasher! I will definitely be using these more than once! We use these for our catering and our customers very happy with the performance. These are good quality and priced very competitively compared to our other vendors. Strong built 10" serving plastic spoon that is great for pasta salads. The spoon are a great price and come in a large size case. A nice way to serve picnic food. A great, cost effective utensil I use for serving hot and cold food items. When it comes to clean up, these make it so easy! We go through a ton of disposable serving utensils and these serving spoons never disappoint. They’re disposable yet very durable, and the black color is attractive. Although we prefer to use non-disposable serve ware for our events, there are certain occasions that call for disposables. In that case, we would definitely recommend these serving spoons as they are both cost effective and functional. These Visions 10-inch black plastic serving spoons are nice. They are disposable but are sturdy and strong. They scoop up food very easily. The price is great as well. These spoons are a great idea for the caterer who is dropping off food for a customer and not worried about coming back to pick them up. GREAT VALUE! I love these disposable plastic serving spoon! They are very durable and actually reusable too! My clients love it! It is a 5 star from me and my customers! The Visions disposable serving spoon works great for leaving with customers for drop-off catering events. No need to worry about washing, just throw in the trash! Perfect! Great disposable serving spoons we do drop off catering events and it is nice to have these. They are inexpensive so there is no worry about not getting them back from catering. They are also durable enough to reuse multiple times. So much cheaper than ordering this through my vendors. Good quality and very durable for the price. The black adds a little more elegance to this one time use product. We love these serving spoons. They are very sturdy and work great for serving sides - potato salad ect for catering. We will order them again soon. Black sturdy serving spoons perfect for buffet style events. The fact that they are disposable makes them even more appealing and also none of them broke during the event we held which was a plus. This six pack of black plastic serving spoons is a great value for the money. These are perfect for any buffet table, catering or home use. Sturdy plastic construction make them reusable over and over. The serving spoons are great value for home use, breakroom use, our potlucks. Made of heavy duty black plastic these are a great choice for a serving spoon. Pack of six is a great value. I have ordered this plastic serving spoon just to try it out. The spoon is sturdy and looks great. It's perfect especially with affordable price. Great disposable serving spoon at an amazing price! Does really well in hot and cold service. Good packaging so that you only have to pull a pack at a time. Perfect size for most jobs. These plastic spoons were ideal for serving food at a buffet table at a party recently. They are strong and sturdy, none of them broke despite serving plates of rice and beans, meats and sauces. Great look for a budget-conscious yet elegant gathering. And nowhere else could you get this many serving spoons for the price. These spoons are perfect for disposable events but are a nice alternative to flimsy clear plastic spoons. The black gives a classier look and they are very sturdy! Great price. For the price on these, you can't go wrong. They are a little light weight, but not enough to be a quality issue. We send these out with our catering orders. Nice plastic serving spoons and they are exactly what I needed. Just got tired nickel and diming at the local stores. Where can you get a great amount for a fair price but the Webstaurantstore? I will be ordering more soon for future catering events. Nice job, guys. We used these spoons to serve fruit at a brunch following a wedding. They worked well and were a great size for our purpose. They held up well and did not break etc. Would recommend. These disposable spoons are great to have on hand for guests that may have forgotten serving utensils at home. They are great for hot and cold dishes. These spoons are perfect for our clients ordering delivery packages for large parties. They are durable and look professional, but do not cost an excessive amount which is perfect for our clients to toss after there event. Great product or catering. Spoons come in packs of 5 I believe. Heavy duty and good width. Ideal for serving cold sides like slaw or potato salad. Our small catering business needed simple serving utensils to include with salads. These worked out great. The quality is fine and they look good, but aren't too expensive. Used these for a catering this past weekend, they are surprisingly sturdy and of higher quality than anticipated, I'm glad I bought plenty to last me a while. Nice, high quality spoon for catering, carryout, or delivery orders. You could probably reuse these if you wanted to- they are that nice of quality. These are nice, they are a good length, sturdy enough to pick up heavy pastas and potato salads, and durable enough to last the entire event be washed and reused. Great price too. These are the perfect solution for elegant serviceware when you know you may not get them back. They are cost effective enough to consider them "disposable". They look great and are perfect for catering. Completely opposite experience with the tongs, these spoons are great! Long handle, wide spoon. Hot foods, cold foods, even creamed corn. No problem. Very good, just a little pricey. I got this for serving up fruit salad on a buffet. The material seems more than throwaway, so I washed it and kept it. It doesn't hold quite as much as I expected, but otherwise it's a great bargin. These serving spoons are a fantastic price to stock up on them. They will break, I've broken a bunch. But for catering they are cheap so you can use them as disposables. Was pleasantly surprised with the quality of these serving spoons. They did not bend when being used for watermelon or potato salad. They have a nice clean look to be used at casual events. Very durable! We use these spoons on our salad bar and for catering. They look very nice and clean well. We will continue to use this product. I love these serving spoons. They are a perfect size for serving catering orders. I like that they come 72 to a case so I don't have to order very often. These spoons are perfect for pick up orders. The are affordable enough for us to consider disposable but our guest feedback indicates they are often washed and reused. great product, a little smaller than i expected but overall very sturdy, great value for the price! much cheaper to buy by the case as well. If you do catering and want to supply your customers with serving utensils this product is perfect! I use all of these products including the tongs. The price point is low compared to my vendors. I'd consider these a semi-disposable serving spoon; we regularly wash and reuse them. They're sturdier than most disposables, you can scoop potato salad, etc. without having them bend in half or break. Used the Visions 10" Black Disposable Plastic Serving Spoon - 6 / Pack to pick up macaroni salad. This spoon is very convenient to have around the house. The spoon had no trouble picking up the salad, which was great. These serving spoons are perfect for catering stews and hot foods like lasagna! Many customers wash and return them because they're sturdy and look nice. Highly recommend these to any caterer! The spoons are ideal to send with our regular and large meals as serving spoons. The design is classy and gives a good impression. The handle is sturdy which is important for serving meat curries. Excellent value! Hot or cold food use, Can be reused if treated "nicely". Can be used for many catering applications. A must have for caters. Used in conjunction with Choice foldable chafer purchased here at webrestaurant.com.. Easy cleanup with minimal breakage during service. Price point extremely low, leftover supply will be used for buffets to come on future. This is a perfect sized serving spoon for our catering orders and work well for the beans, rice and meats. They are sturdy and easy for both our employees to use and the guests when left with drop off bards. Great price and value. We use these for our to go orders. They look very modern and are sturdy. They are much nicer than some of the other disposable serving spoons out there.